Sporting a plumb stem and a slightly raked reverse transom, the Dufour 36P (“P” for performance) seems at first glance to be designed solely for speed: a notion that chines just above the waterline aft and a tall nine-tenths rig with swept-back spreaders do little to dispel. Sporting a plumb stem and a slightly raked reverse transom, the Dufour 36P (“P” for performance) seems at first glance to be designed solely for speed: a notion that chines just above the waterline aft and a tall nine-tenths rig with swept-back spreaders do little to dispel. 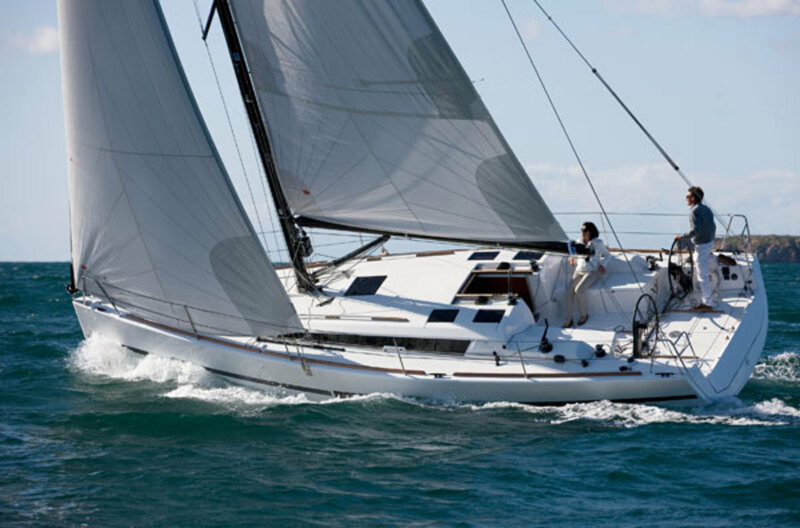 However, the 36P, which was developed from Dufour’s successful 34e and 40e models, is still very much a “dual-purpose” boat for the sailor who wants to cruise, race or daysail with friends and family. The 36P’s vacuum-bagged hull features a PVC foam core above the waterline and solid laminate below for maximum strength and lightness. 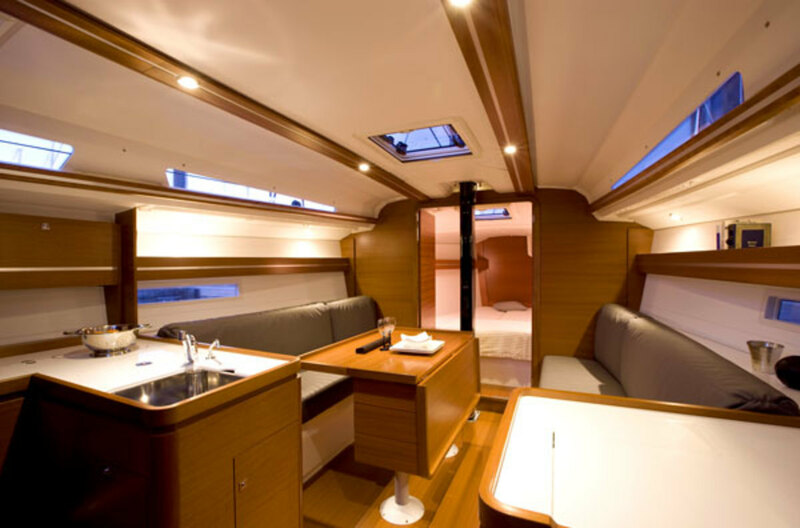 A molded grid glued and glassed into the inside of the hull adds more strength and stiffness while providing a base for interior furniture. The exterior gelcoat and first layer of fiberglass cloth are infused with NPG resin to form a barrier to osmotic blistering. The deck is resin-infused with a PVC foam core and is glued to the hull’s inward-turned flange. In my first glance at the Dufour 36P from the dock, I took in a wide cockpit, a low-slung house and uncluttered decks. Flush-mounted hatches complete a nice, clean look. Climbing aboard over the drop-down transom, I found a wide walkway leading between the twin wheels to the companionway. The teak cockpit decking will provide a good grip when the boat heels. The aft half of the cockpit seats are removable and can be used for storage or filled with ice and cold drinks. Teak toerails run fore and aft inside the stanchions, and grab rails run forward of the mast on the cabin house. Three mooring cleats are mounted on the gunwale to either side, eliminating the need for fairleads. Because there are no overlapping headsails, the shrouds can be led to chainplates outboard on the topsides. This makes for very strong support for the Sparcraft double-spreader mast and opens up the side decks for easy passage. The mainsheet is led “German style” with a two-part purchase on the traveler just forward of the wheels, then inside the boom to the gooseneck and down to blocks on either side of the house, where they continue aft to a pair of winches within reach of the helmsman. Another pair of winches on either side of the companionway hatch deals with halyards, reef lines and other controls that are led from the mast under the deck to rope clutches. All around the boat I noticed good ideas, like the deck shower hidden next to a fold-down transom that serves as a swimming platform and includes a built-in telescoping boarding ladder. There is also stowage for a liferaft, where it will be handy, but out of sight when you’re sailing. Removing a dropboard and sliding the companionway hatch forward allows excellent access via wide, gently sloped steps to a cabin that is bright and airy, thanks to six opening hatches, two opening ports and fixed ports in the house and topsides. Golden brown Moabi wood and white gelcoat compliment interior styling that is modern, comfortable and inviting. To starboard of the companionway is a good-sized head and shower. A hatch in the aft bulkhead opens into a cavernous storage space beneath the cockpit. This locker can also be accessed from a hatch on deck aft of the wheel. Forward of the head is a nav station with a large working desk; opposite is an L-shaped galley. 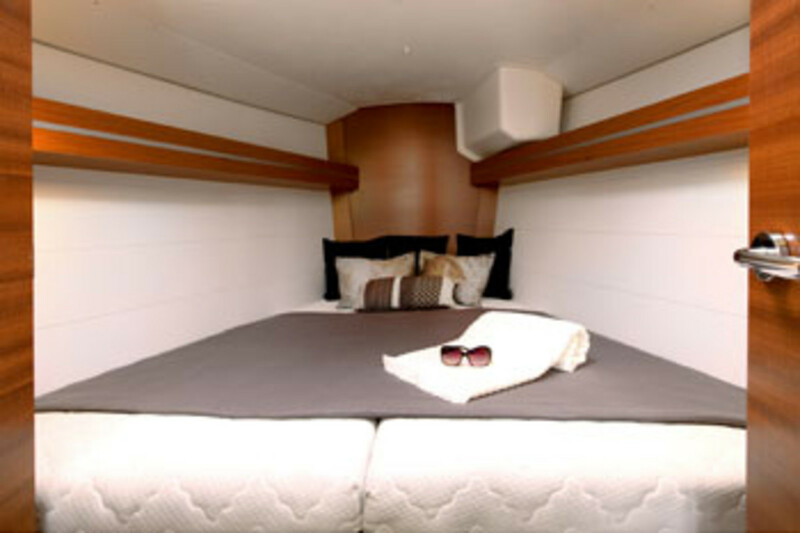 Aft to port is a stateroom boasting a huge double berth and a hanging locker. There’s just enough room to stand and get dressed in here without opening the door. In the saloon, settee berths flank a centerline table with folding leaves on both sides. I really like the ports in the topsides, which allow diners a panoramic view of the outside world. A comfortable V-berth graces the large forward stateroom. In many boats, there’s no place to stow gear and supplies. Not so aboard the 36P. From the giant locker aft of the head to the hanging lockers in the staterooms, storage space abounds. In the galley, in addition to the usual lockers, pans are built in under the sole, isolated from the bilge so they can be used for dry storage. The engine sits under the companionway steps. Access is way above average, not only by removing the engine box, but from behind and through hatches on either side. It was a perfect day for a test sail; sunny with 11-14 knots of breeze and flat water outside the marina. Main up, we eased the furling line and sheeted home the 100 percent jib. I was expecting good performance from the 36P, but we felt like we were on an elevator as a tweak on the mainsheet gave us an effortless 6.7 knots at about 28 degrees off the apparent breeze. The hull’s form stability and a lead bulb at the bottom of the high-aspect fin keel kept the boat on its feet as we tacked down the bay. The non-overlapping jib flew across the foredeck with a tug at the sheet with little winch grinding required. We turned around sooner than I would have liked, but this did give us a chance to extend the bowsprit and hoist the asymmetric spinnaker. Within seconds of sheeting it in, we were reaching at 9.5 knots. Very impressive in a 36-footer! Gybing proved a piece of cake as the sail slid easily around the forestay. Thanks to wide side decks, good molded-in antiskid, and a well-conceived layout, sail-handling was a breeze on all points of sail. Our test boat was equipped with a 30hp Volvo saildrive (a 40hp engine is optional). In smooth water, we made 6.4 knots at an economical 2,200 rpm. Knocking the revs up to 2,800 gave us 7.6 knots. Insulation on the engine box was such that noise on deck was negligible. Though it was obvious the engine was running, we didn’t need to raise our voices to chat below. Back at the marina, the deep spade rudder allowed us to turn 270 degrees and back into a very tight slip with no drama. One of the things I love about cruising is slipping along in light airs enjoying the quiet way the boat moves through the water. Too often, though, schedules or impatient crewmembers demand that we get to our destination in a reasonable time. On many boats, this means turning on the engine. Thanks to its performance design, the Dufour 36P will make good speed under sail even in the lightest air, so you’ll be able to put off burning diesel for quite a while.